Sailing Club AMAC SP "Bofor"
The municipality of Ohrid (55,749 inhabitants; 389.93 sq. km; official website, unofficial website) is made of the town of Ohrid and the settlements of Vapila, Velgošti, Velestovo, Gorno Lakočerej, Dolno Konjsko, Dolno Lakočerej, Elčani, Zavoj, Konjsko, Kosel, Kuratica, Lagadin, Leskoec, Livoišta, Ljubaništa, Openica, Orman, Peštani, Plakje, Podmolje, Pamce, Pasino, Pečica, Sviništa, Sirula, Skrebatno, Trpejca and Čipokno. The town of Ohrid is built on the site of the antique town of Lychnidos, described in Byzantine sources as "situated on a high hill near the large lake of Lychnidos, by which also the town was named Lychnis, previously known as Dyassarites". Several Roman documents say that Lychnidos was located on the Via Egnatia, the shortest route from Rome to the Eastern Empire, already a main regional communication route long before the Roman colonization. Herodotus call the oldest inhabitants of the region Brigians (Phrygians who migrated after the fall of Troy) and Enhelians. The name of the Enhelians comes from the Greek word encheleus, a snake or rather an eel, maybe because Lake Ohrid is rich in eels. The early history of Lychnidos is less known; the Enhelians have been considered as the same people as the Illyrians, although Herodotus clearly says there are two different peoples. Philip II of Macedonia defeated the Illyrians near today's Bitola and expelled them to the north-eastern shore of Lake Ohrid. In 335 BC, the revolted Illyrian ruler Klit was defeated by Alexander and Illyria was probably annexed to Macedonia as a province. In the 3rd century BC, Rome expanded eastwards and later suppressed the powerful Macedonian state after three wars and the eventual defeat of King Perseus; Macedonia became a colony in 146 BC and Lychnidos emerged as the main Roman town in the region, which was known as Desaretia. The town was wealthy, as proved by its numerous monuments, especially the Roman theater rediscovered in the beginning of the 20th century. In 343 AD, the acts of the conclave of Serdika were signed, among others, by "Dionysius de Macedonia de Lychnido", the only known Bishop of Lychnidos in the 4th century. This confirms the mention of the town as an episcopal centre in sources from the late classical period. The history of Lychnidos ended on 29-30 May 526 when the town was destroyed by an earthquake that killed several thousands of its inhabitants. Since Lychnidos was never mentioned again by later sources, it is believed (but not proved) that the town was never rebuilt. The Slavic colonization of the region of Ohrid was achieved in the 630s by the tribe of Berzites, which had entered a decade earlier the grand Slavic alliance led by Hatczon. The Berzite territory, spreading up to the modern sites of the towns of Veleš, Kavadarci, Prilep, Bitola and Debar, was called by the Byzantines Sclavinia Berzitia. The ruined town of Lychnidos was rebuilt and renamed Ohrid, maybe after the Slavic root hrid, "a hill". By the end of the 6th century, the Byzantine influence disappeared and the town developed, which prepared the emergence of a powerful medieval state. There are very few historical sources on that period. In the late 7th century, the Bulgarian Tsar Boris incorporated most of Sclavinia into his state. The tsar imposed the Christian religion to the region; in 846, he allowed Greek priests to christen his subjects. In 886, the tsar commissioned the monk Clement (d. 916), later known as St. Clement of Ohrid, to found a Slavic church in a region covering modern southwest Macedonia and southern Albania. For the next seven years, Clement selected and taught 3,500 students and built or rebuilt several churches. When Clement was appointed Bishop of Velika by the new Tsar Simeon (893-927), he was succeeded by St. Naum (d. 910). Clement and Naum founded the Ohrid Glagolitic Literary School, which was the base of the further Slavic literature and culture. In the second half of the 9th century, Ohrid was a main center of the Slavic culture. At the end of the 10th century, the Bulgarian Tasr Peter died during a conflict with the Byzantines and the Russians. In 969, the sons of the Slav prince Nikola launched an uprising in the region of Ohrid and proclaimed an independent state known as Samuel's Empire. Samuel increased his state to Bulgaria, Serbia, Greece (Salonica excluded), Albania and Croatia and obtained from the Pope the upgrading of the Macedonian Church to a Patriarcate. Ohrid, a medieval town (polis) protected by a citadel (acropolis), became the political and religious capital of Samuel's Empire. The town was seized in 1015 by the Byzantine Emperor Basil II; the fortress, however, was kept by Samuel's heir, Tsar Jovan Vladislav, who was murdered in 1018. Basil ordered the suppression of the former Empire's main towns to prevent any further uprising; in 1073, Ohrid was considered as ruined. The Emperor, however, maintained the Ohrid Archiepiscopate as a means of controlling the region. In 1081-1085, Ohrid was occupied by the Normans from Sicily; the erudite Al Idrisi, from the court of Palermo gave in his Geography (1153) a detailed description of Ohrid. After the Normans' withdrawal, Ohrid was submitted to religious unrest caused by the Bogomils, Manichean sectarians said to be the remote origin of the Cathares (often called in France bougres, a deformation of Bulgares). In 1204, the Crusaders seized Constantinople and Ohrid was incorporated to the Latin Kingdom of Salonica. The cultural activity did not decrease; in 1230-1242, the scholars Beloslav, Josif and Tihota wrote a manuscript made of 264 papyrus sheets, known as the Bologna Psalter. In 1334, the Serbian king Dušan seized the towns of Ohrid, Prilep and Strumica, and kept them until the Ottoman invasion at the end of the 14th century. Some Turkish documents seem to indicate that the Turks seized Ohrid in 1395, Chandarli Hairudin Pacha becaming Vizir. The presence of the Turks in the region is ascertained by an inscription in the St. Ilija church of the village of Elsani, dated 1408. The sanjak of Ohrid was one of the oldest and most important in the Balkan; it was ruled by a sanjak-bey, the first of them being Ajdinian Guneid Bey, appointed in 1406. After the colonization, the Ottomans transformed ancient Christian buildings into Muslim ones, such as the St. Pantheleimon monastery of Plaosnik, transformed in what was most probably the first mosque in the region. In the 16th century, the St. Sophia cathedral was also transformed into a mosque. In 1582, a census yielded 13,592 inhabitants for Ohrid, whose municipality included 88 villages. The Ottomans did not suppress the Ohrid Archiepiscopate, which enlarged progressively its zone of influence, incorporating the Eparchies of Sofia and Vidin (early 15th century), Vlaska and Moldavia (middle 15th century), parts of the Serbian Church prior to the reestablishment of the Pec Patriarchy, and even for a while in the 16th century the Italian Eparchy. In the late 17th century, conflicts within local parties caused the suppression of the Ohrid Archbishopric by the Sultan in January 1767, following the resignation of Archbishop Arsenius, and its incorporation to the Constantinople Patriarchate. In the 19th century, the ruler of Ohrid, Gheladin Bey attempted to increase its autonomy, which caused a lot of troubles with the Sultan and his feudal neighbours; the town was hit by the black plague in 1810 and 1816. Gheladin hired Kuzman Kapidan to defend the town; he and his band of 40 soldiers are celebrated in several folk songs. The Sultan's army eventually attacked and seized Ohrid; in October 1832, Gheladin Bey fled to Egypt and his properties were confiscated by the Sultan. In the 19th century, Ohrid was a center of the Slavic revival, led y the school teacher Dimitar Miladinov, who published together with his brother Konstantin Collected Works in Zagreb in 1861. He was followed by his student Grigor Prlicev, whose Autobiography (1885) relates the Ohrid revival. Another teacher, Kuzman Sapkarev, wrote eight books in the local dialect from 1868 to 1874. At the same time, an uprising known as The Ohrid Conspiracy, the Ohrid-Demir Hisar Rebellion or the Brsjak Rebellion, broke out in Ohrid during the Russian-Ottoman war; in May 1881, the plotters met in the monastery of Slepce in Demir Hisar to prepare an uprising scheduled to fall 1881 in Ohrid, Resen, Prilep, Demir Hisar and Kruševo. The Ottomans were warned and several members of the conspiracy were arrested and jailed for years. In 1903, 31 battles of the Ilinden Uprising took place in the region of Ohrid, where several villages were burnt down by the Turks. The biggest battle took place near Rasanec, during which most leaders of the insurrection were killed, which ended it. During the Uprising, the town of Ohrid was used as a resupplying base and an hospital was founded by the teachers from the town, later transferred to the English Mission. In the beginning of the 20th century, Ohrid declined and several of its inhabitants emigrated to America, for instance 3,639 in 1907. During the Balkan Wars, Ohrid was successively incorporated to Serbia (1913), to Bulgaria (1915) and eventually to Serbia (1915), and later to the Kingdom of Serbs, Croats and Slovenes, on the border with Albania, which was fixed only in 1926. During the Second World War, Ohrid was occupied by the Bulgarians and then the Germans, and was eventually liberated on 8 November 1944. On 17-18 July 1967, the Holy Synod of the Macedonian Orthodox Church gathered in the St. Sofia church in Ohrid and issued the Declaration on Proclamation of Autocephality of the Macedonian Orthodox Church, as the successor of the restored Ohrid Archieposcopate. On 1 August 2001, the Ohrid Agreement was signed by representatives of the Macedonian government and the Albanian ethnic minority; it was approved by the Albanian guerilla on 13 August and ended the unrest in the ethnic Albanian areas of Macedonia. Lake Ohrid (Ohridsko Jezero), shared by Macedonia and Albania (2:1, called in Albania Lake Pogradec) is surrounded by ranges of karstic mountains (Mokra, 1,589 m; Jablanica, 1,945 m on the Albanian side; Galicica, 2,255 m on the Macedonian side). The area of the lake is 358. 2 sq. km (maximum length, 30.8 km; maximum width, 14. 8 km; average depth, 164 m; maximal depth, 289 m). The lake was formed in the Tertiary era and is therefore pre-glaciary and among the oldest lakes on Earth. Most of its water comes from surface and underground springs. In the beginning of the 20th century, the geologist J. Cvijic postulated that the water from Lake Prešpa, located 158 m higher, was able to percolate through the karstic areas separating the two lakes; the connection between the lakes was indeed proved in 1980, using natural isotopes: half of the water of the springs located near Sveti Naum comes from Lake Prešpa. Lake Ohrid harbours a rich flora and fauna with several endemic and relic species. There are for instance 36 species of Copepods (small crustaceans) in the lake, six of them being endemic and two of them (Diacyclops ichnusoides and Bryocampus mirus) having been described in 1997. Lake Ohrid is a unique ecosystem that needs to be preserved. In February 2005, Macedonia completely banned fishing of the endemic trouts (Ohrid Trout and Belvica), two endangered species. However, poaching and the lack of protection measures on the Albanian sides have led to a decrease of the trout populations. Swimming competitions started in Lake Ohrid in 1924. The international Ohrid Swimming Marathon (30 km from Sveti Naum to the port of Ohrid) was reestablished in 1992; it is since 1998 one of the 12 swimming marathons sponsored by the World Swimming Association. In 1979, the UNESCO Committee inscribed Lake Ohrid on the World Heritage List under natural criteria. In 1980, the listing was extended to include the cultural and historical area, and cultural criteria were added. On a blue field a green hill surmounted by a silver fortress, with two towers and a gate. At the foot of the hill is represented water, with a sailboat with a golden hull and mast, topped by a trifoliate cross, and a silver sail. This shield shall appear on the three versions of the arms. The middle arms are similar to the lesser arms with a mural crown added above. The crown has three fortified towers, the middle one above the gate. The diadem is ornamented with rubies and pearls. The greater arms, the most solemn ones, are surrounded by branches of oak tied with a ribbon. The flag is blue, designed according to the principles of vexillology and heraldry. Its design is partially based on the coat of arms but is not a full copy of it. Proportions are 2:3. "The municipality has a flag in dark blue colour. The municipal coat of arms is in the centre of the upper half of the flag. Proportions are 2:1." However, most flags used in Ohrid are as shown on the Macedonian Ministry of Local Self-Government website (page no longer online), that is vertical, in proportion 5:3, blue with the municipal emblem in the middle. A photo credited to "EAPC Security Forum", published on the Europe Stability Initiative (ESI) website, May 2008, shows a row of four flags, from left to right, Macedonia, NATO, EAPC, and Ohrid. The four flags must have a proportion matching the official specification of the Macedonian flag, that is, 1:2. Accordingly, there exists a horizontal variant of the flag of Ohrid, with, seemingly, the emblem centered both horizontally and vertically. The emblem is a yellow circle, in which is placed a blue diamond outlined in yellow and connected to the circle by two vertical yellow stripes. Inside the diamond is placed the municipal shield. The basis of the shield shows a ship on Lake Ohrid. The ring with diamond surrounding the emblem is the emblem of UNESCO World Heritage List. We believe that the designer of the shield without the writing was the late Pero Cimbur, a designer from Zagreb. Along the chief is probably inscribed in Cyrillic letters the name of the town. The sulfur find "Duvalo" is an active post-volcanic phenomenon situated close to the village of Kosel, near Ohrid. Its appearance resembles miniature crater with a diameter of 0.5 m and depth of 30 cm. Gases of carbon dioxide and sulfur hydrogen are released from its hole, making this phenomenon mofeta (sulfur hydrogen find) and sulfatara (hole releasing gases of sulfur and hydrogen) at the same time. It represents the last trace of extinction of a former volcanic activity. 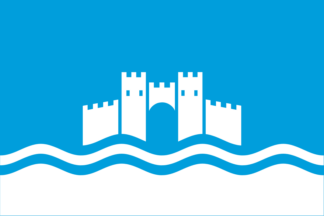 The flag of Kosel, as shown on the website of the Ministry of Self-Local Government (page no longer online), is blue with a white triangle along the hoist, charged with the municipal emblem. The emblem is a blue disk with a green mountainous background and a main charge most probably representing the Duvalo "volcano". The image shown above was made after an earlier version of the website (no longer online, either), slightly differing by the writing OPŠTINA (municipality) KOSEL. On the image, KOSEL is written on the volcano whereas OPŠTINA is written on a golden scroll placed below the volcano. On the later website image, OPŠTINA is written on the volcano above KOSEL whereas the scroll is indeed three golden lines. The font also differs between the two emblems. The burgee of Sailing Club AMAC SP "Bofor" is shown on the club website.